If you are a fan of the Windows Sidebar and the Pomodoro Technique, please feel free to download and use my Windows 7 Pomodoro gadget. A gadget “package” is just a zip file, so you can easily unzip this download and inspect the code if you’d like. To install, just double click. To start a work session, click on “25m”. To start a short break click on “5m” and to start a long break, click on “15m”. You can stop the timer by clicking the little red bullet between the “25m” and “5m” links. After installing, you can drag the gadget anywhere on your screen you’d like. I like to make mine “Always on top” with an 80% opacity, which you can set by right-clicking on the gadget. Next steps for this little utility will be adding a options pane to configure the intervals, adding an optional ticking “in the zone” sound, and possibly making the stop button a pause/restart button. get error message saying not a valid gadget file when double clicking to install. Also, could you add a ticking kitchen timer sound as an option? That would be an even better pomodoro! 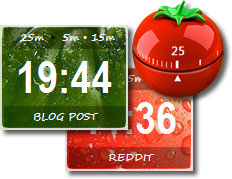 Just wanted to drop a quick comment to tell you that I love your Pomodoro widget! Works very well on my Windows 7 environment. Thank you for that, I had been looking for a pomodoro widget for windows like yours for a long time! I really like your timer. But, now that I see it’s a Windows gadget I’m concerned. I turned them all off a couple of years ago because of safety issues. Are you sure this gadget won’t leave computers vulnerable to hackers? Great app!!! Just wondering when you’re planning to release the next update with customize intervals? or if to auto-start the break interval after work interval has time up. Gadget is also working on Windows 10 x64 using 8GadgetsPack. Exactly what I required. Thanks much. Thank you very much for gadget! It’s very simple and nice. Sweet! Quick, easy, works just like it should. Thank you, Mitch! Thank you so much for this gadget. I have been using this for 2 years! It’s probably the best one there is. The ease of choosing 3 diff time limits is great. Would you make it work for Windows 10 as well? Please make it donation-ware too, I think a lot of people would chip in. Thank you so much!! My organization still uses Windows 7, and this works perfectly. So easy to install and use. I literally downloaded 4 other pomodoro apps that I could not use because they turned out not to be free, wanted me to create an account, or install Java. This is truly free.